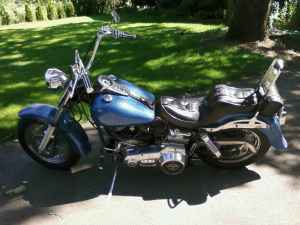 Might you be interested in taking this fine vintage Harley Davidson Shovelhead motorcycle for sale home with you? It is truly a joy to own a bike like this one that has withstood the test of time and that is head and shoulders above most used motorcycles in classifieds that you see. *new polished aluminum valve covers. *dual disc brakes on the front, single after market disc brake on the rear. *after market belt drive primary. *new Dyna-S single fire electronic ignition system. *both electric and kick start. *original Harley Davidson saddlebags in need of polishing and cleaning. *newer rear tire, front has approximately two to three seasons of riding left on it. *just installed brand new starter solenoid. To do that you will need to leave your questions and contact information in the space below provided by Strike Lightning Used Motorcycles for Sale and the owner will get back with you as soon as possible. Strike Lightning would also encourage bikers to submit a review of the 1975 Harley Shovelhead for sale to help potential buyers make informed decisions and to benefit the biker community as a whole.